1. Preheat the oven to 200˚C, gas mark 6. Line a baking tray with baking parchment; arrange the squash on one side, with the beetroot on the other. Sprinkle each with ¼ tbsp oil and season, then scatter the paprika over the squash; roast for 25 minutes, turning the vegetables halfway through. 2. Mix the remaining 1½ tbsp oil with the vinegar, maple syrup and allspice; season. Prepare the quinoa according to pack instructions, then place in a bowl and toss through ½ the dressing and 2 tbsp almonds. Toss through the rocket leaves, then spoon onto a large serving plate. 3. 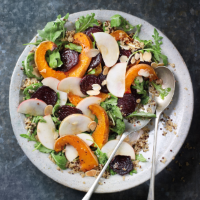 Arrange the roasted squash and the beetroot over the quinoa. Halve, core and finely slice the apple just before serving, then scatter over the salad. Spoon over the remaining dressing and scatter with the remaining almonds to finish. Serve immediately.